Students can Apply for Masters Part-1 Regular Admission by NU Official Admission portal admission.nu.edu.bd or app1.nu.edu.bd. 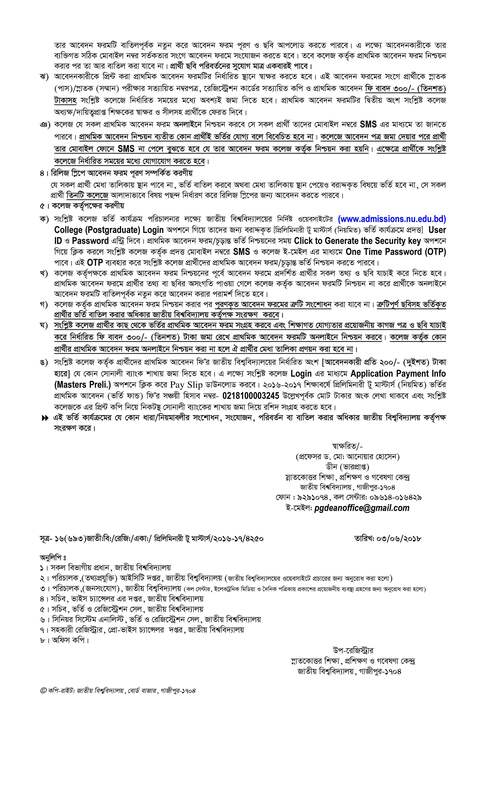 If you want to Apply for National University to Preli Masters for Affiliated College of National University Bangladesh you should follow the instruction. visit http://admission.nu.edu.bd Select Preli Masters Tab Left Sidebar. Input your Degree Roll, Registration Number and Passing Year . Finally Submit the Application Form with Required Documents and 300/= to your target college within 27 June, 2018. It is to be noted that in the academic year 2016-2017, students will be admitted in the preliminary to masters regular program, according to the old syllabus of the Master’s 1st year of the year 2014-2015 academic year will be given for the study and examination. Under the admission process, the candidates who have passed the 3 Years graduate (pass) regular examination from 2004 to 2016 and pass graduate (Honors) in the 4 Years post-graduate (Honors) examination can apply and minimum 40% marks in admission (400 numbers) or minimum GPA-2.00 of CGPA system. This Admission Process Will be Complete in 4th Steps. Candidates have to Apply by online in NU official Site. After Complete Application Form by online, Students have Download or Print a Application Copy. Step Two: Student Have to Submit Application Form with TK. 300/- Along With All Necessary Papers. Step Three: NU Authority Will Publish Merit List According To Previous Exam Result. Step Four: After Publishing Merit list, Candidates have To Admission Desire College.